We love designing new DIY projects that reflect our love for Scandi style. Our last project that featured Scandinavian designs were these cute pillows that are perfect for fall. 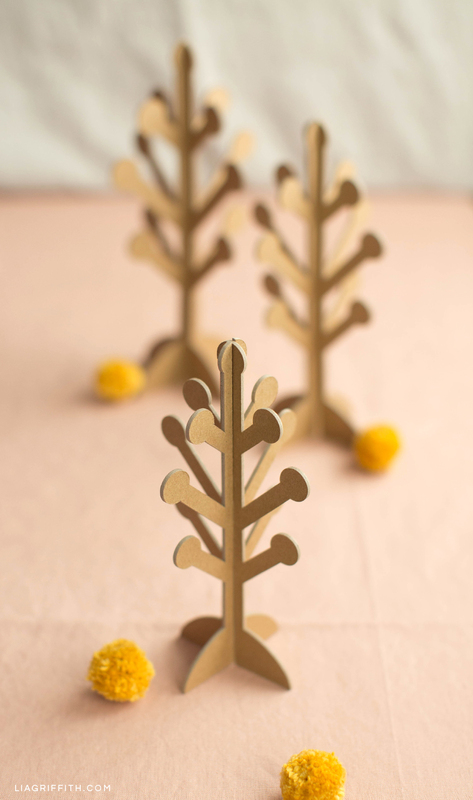 Since nature elements are really common in Scandi style, we decided to make some trees! 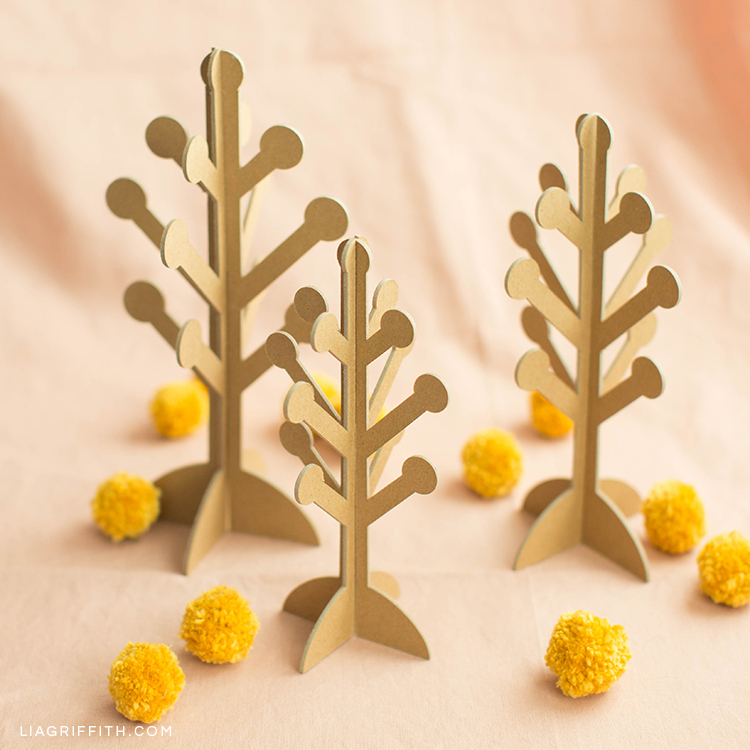 These Scandinavian-style 3D paper trees took a little bit of time for our Cricut Maker to cut; otherwise, they’re a super simple craft to put together. 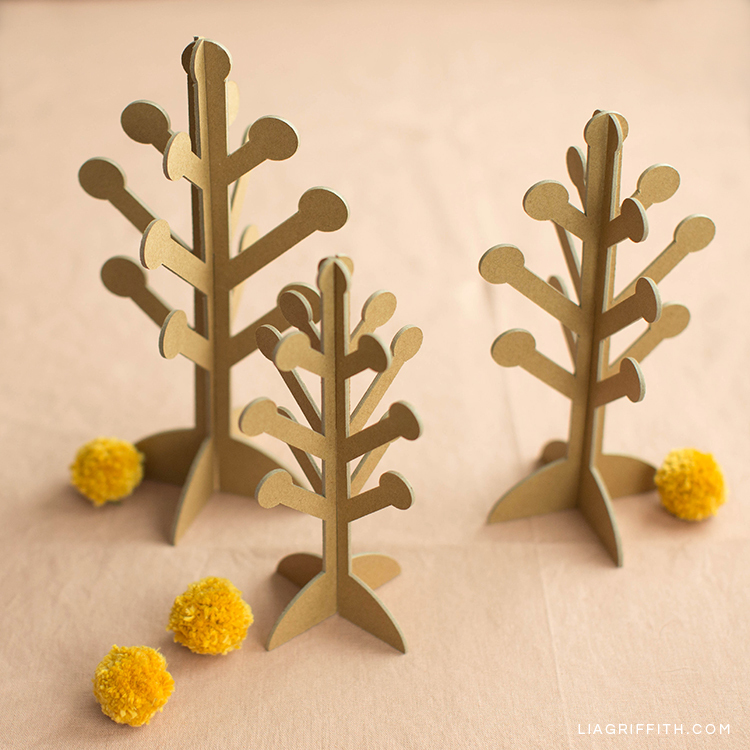 We think these Scandinavian-style 3D paper trees make great fall decor. And they look super cute on our mantel! We paired these trees with our papercut oak leaf framed art and a few pom pom billy balls. We made these pom poms for some other fall projects and thought they’d be a fun addition here. You can find these pom poms in our billy ball craspedia flowers and our billy ball wreath. What do you think? 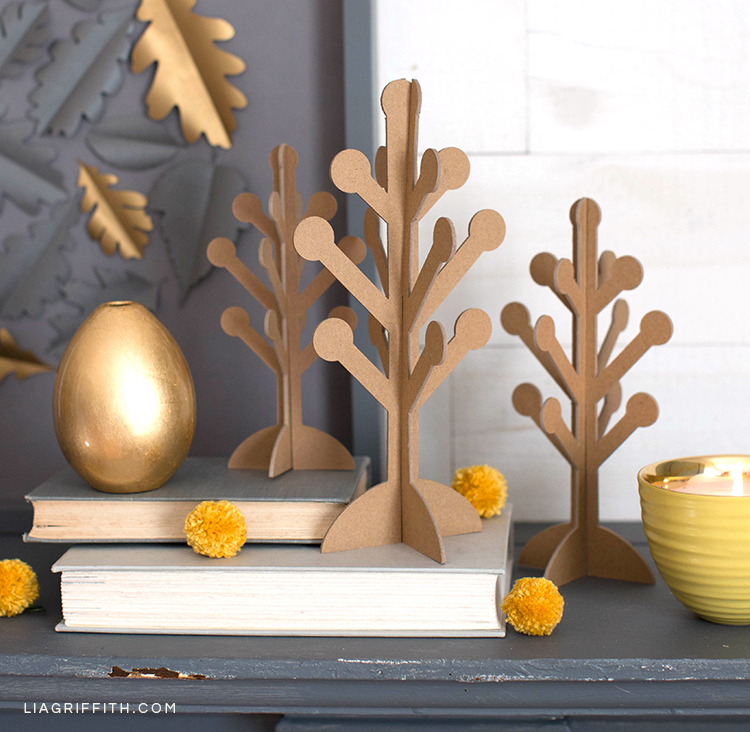 You could decorate your own mantel with these trees or use them as décor for your bookshelf or maybe a small table. They’d also make great holiday décor! 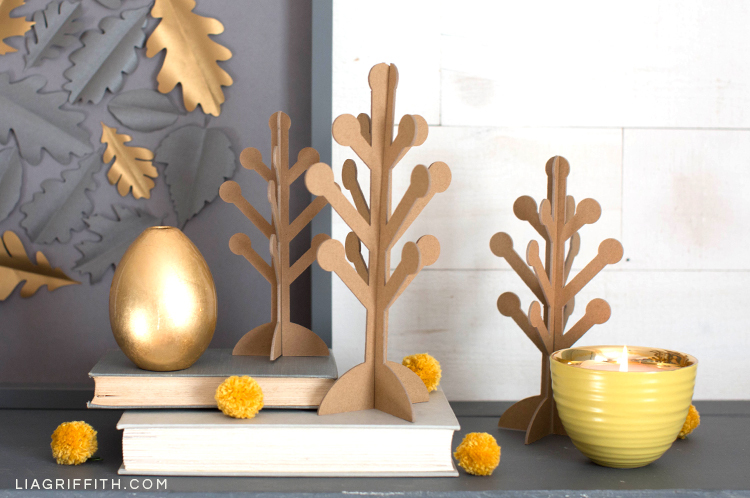 You could use regular cardstock for this project, but we wanted to use chipboard for these trees. It also gave us an excuse to try out Cricut’s Knife Blade! This is our first DIY project using Cricut’s Knife Blade and we’re really happy with how it turned out. We plan on using the knife blade for more projects in the future. Ready to make this project? 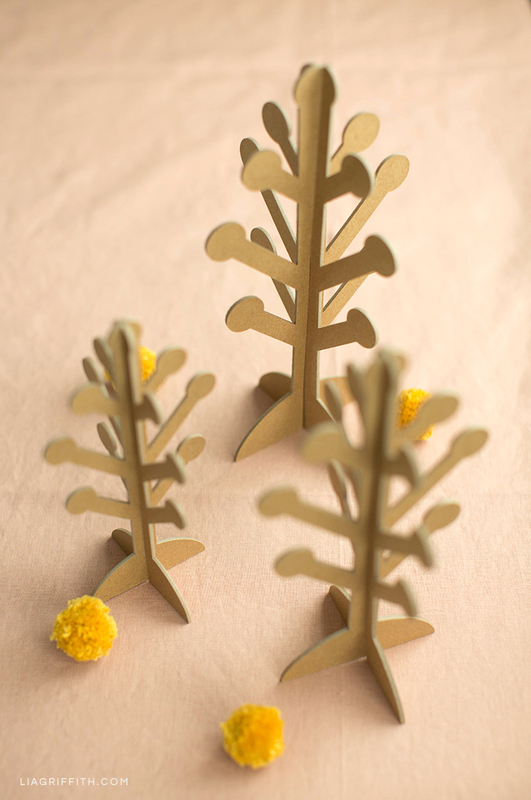 You can find the SVG file for these Scandinavian-style 3D paper trees at the bottom of this article. We’ve also included a printable PDF if you’re cutting the trees by hand. Be sure to follow the instructions in Cricut Design Space for using the knife blade when cutting thick material. Cutting with the knife blade takes a while (about 35–40 minutes per set! ), but the results are amazing! If you decide to use regular cardstock instead of the chipboard, you’ll need to cut and layer multiple sheets of paper. Once the pattern is cut out, just slide the two pieces together through the top and bottom slots. Like Scandi style? Get more ideas. You can find more Scandinavian projects here. We’ve got printable gift wrap, iron-on designs, fun notecards, and more! You can also find our latest DIY projects on Instagram, Pinterest, Facebook, Twitter, and YouTube. If you have a fall craft you’d like to share with us, please do! Just post your DIY creations on Instagram and use the hashtag #MadeWithLia so we can find it. We might also repost it on our social pages or share it in our weekly email.